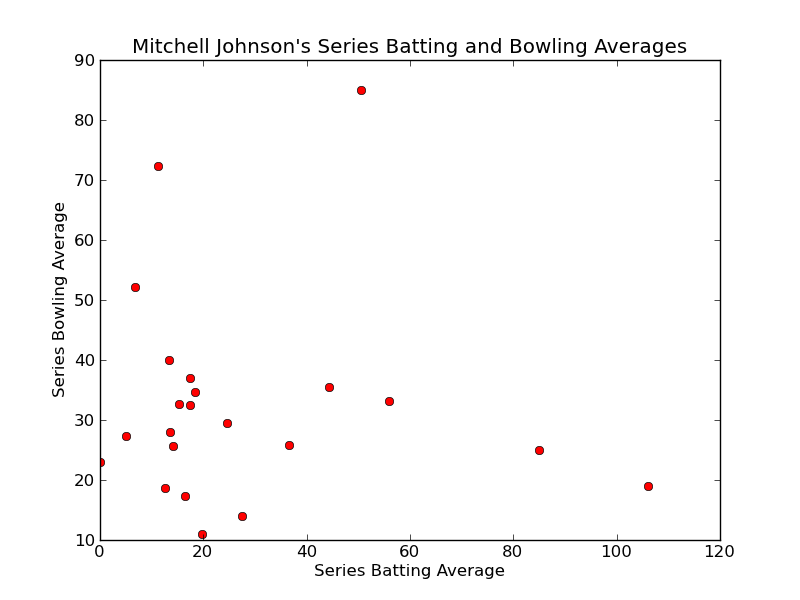 We need to look at the data: Does Mitchell Johnson's bowling "feed off" his batting? Interesting. I've also understood the claim about this relationship to be that a good innings can be the trigger for a good period of bowling - not necessarily that he will continue to bat well, which is the implication of your series-by-series analysis. Any evidence that what separates Johnson's bad and good bowling form is a good innings? Good point. I agree that probably the right way to think about the lack of correlation between his series averages is that he doesn't necessarily continue to bat well, if he does continue to bowl well. 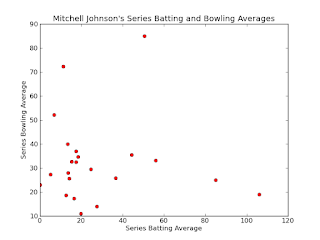 As for whether a good innings is what separates Johnson's bad bowling from his good bowling- there is some evidence for this. I had a little look at his innings by inning bowling figures in the series where he scored at least one fifty. The pattern is a little difficult to establish because in quite few of the series he was also bowling quite well before scoring the fifty. However, in those series where his bowling average wasn't good (>35) before his fifty it improved markedly afterwards. On the other hand, where his bowling average was already <35 it always stayed <35 after the fifty. So, there is some evidence for what you're saying, but the dataset is a little small. (I only had time to look at this quickly so I apologise if I've made a mistake somewhere).